The KE Arms Team Rifle was built to be lightweight and fast handling. Add the muzzle device of your choice and the rifle is ready to rock for 3-Gun/Multi-Gun Competition. Optics and Rail Accessories pictured are NOT INCLUDED. 17.7" 5.56 BALLISTIC ADVANTAGE (3-GUN) MIDLENGTH AR-15 BARREL: This 5.56 chambered 17.7 inch Performance Series Barrel is machined from 4150 Chrome Moly Vanadium steel with a QPQ Corrosion Resistant Finish. Performance Series barrels feature a FailZero Nickel Boron Coated Extended M4 Feed Ramp Extension. This barrel features a pinned gas block. An A2 Flash Hider is Included so the end user may add the muzzle device of their choice. KE-15 Billet Flared Mag-well Lower Receiver is precision machined in-house from hi-grade 7075 billet master plate to mil-spec standards making it compatible with most mil-spec M16/M4 uppers. Features a broached mag well and mil-spec 8625 type III, class 2 hard anodized. The flared mag well dramatically reduces fumble factor for reloads in all shooting positions and during movement. 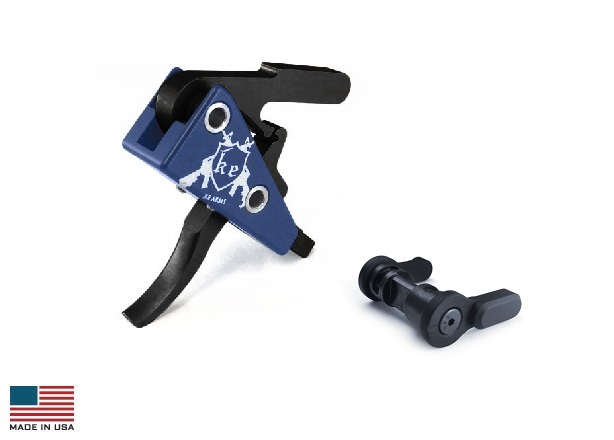 DMR Trigger: Our DMR Trigger has a clean, crisp predictable break point with one of the shortest resets on the market. Speed and Accuracy go hand in hand with the DMR.